We come to you and educate your members, residence or congregation on all the workings of the fire department. Majority of our public education programs are included in this one seminar. Our seminar can be for a group in attendance as small as 6 and has been as large as 100. One of our fire engines will be brought to the seminar for a tour. Not only do we come to you with all of our public education resources but, we come to you to prepare for hurricanes. Hurricane stickers can be issued on site at your seminar. We are proud to announce that we are now implementing a Pet Locator program within our community. Pet Locators are decals designed for fire personnel in the case of a fire to alert them that an animal might be trapped inside. The sticker can be easily installed on a window or front door of your residence. Click HERE for more information. 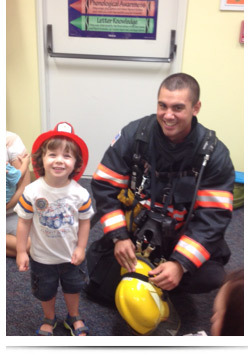 A small group of 4-8 people will learn about types, safety, and use of fire extinguishers. They will also have the opportunity to use a training extinguisher on a controlled fire. Call Inspector Urich at Station 1 Monday-Friday from 8 a.m. to 4 p.m. to schedule a training. Tours are interesting for all ages. 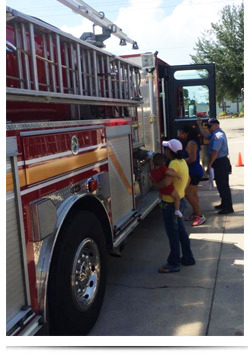 Take a tour of the fire station and check out the trucks and equipment. Call Chief Mickuleit at Station 1 Monday-Friday 8 a.m. to 4 p.m. to schedule your tour. Currently we have 4 certified CPS techs located at station 1 at the center. If you need your seat checked or need more information on infant seats through boosters. Please don’t hesitate to call and speak to Fire Inspector Urich or Admin. Assistant Richter at station 1 Monday-Friday 8 a.m. to 4 p.m.
W.H.A.L.E (we Have a Little Emergency) Check is and education and identification program for parents who have children in a car seats. Click HERE for more information. Let our fire personnel educate you and your family on proper smoke alarms. Matlacha/Pine Island Fire Control District will come out to your home and inspect your smoke alarm and inform you of possible hazards, current statues and current building code specifically about smoke alarms. Let’s team up. All we need is your communities interest, our fire department and the American Red Cross to join together and prevent tragic death in your community. American Red Cross and Matlacha/Pine Island Fire Control District work closely for many weeks planning a free install event. If you believe your community would be interested please call Inspector Kulwicki at station 1. Please allow a couple of months for planning and organization procedures. This is an Emergency Information Program that provides first responders with vital information, such as medications and medical history. It is easy to complete! Just fill out an In Case of Emergency (ICE) medical and contact form. Then, place it into the provided red magnetic envelope and place it on your refrigerator. The kit also comes with a sticker to place near the front door so emergency crews are aware that this vital information is in your home. This helps first responders since all the information needed is in one designated place. Your home does not have to be the only place you can utilize this great program. It could be used in your car, boat, or even motorcycle. If interested, call Chief Mickuleit at Station 1 Monday-Friday from 8 a.m. to 4 p.m.
Small groups of 4-8 people will receive information about Cardiopulmonary Resuscitation, Automatic External Defibrillator, and Basic First Aid. This is a great class for everyone! Call Inspector Urich for more information about classes and how to register. He can be reached Monday-Friday 8 a.m. to 4 p.m. at Station 1. Each station is equipped for everyone's convenience to drop off their Sharps Containers. Residents will also be provided with a new container. This is a program designed to temporarily assist youth who are in need of assistance with medical, housing, or family issues. Each station is a Safe Place. Service offered at events at request. Free blood pressure screening by Matlacha/Pine Island Firefighters. Contact Fire Inspector Urich for more information at Station 1 Monday-Friday 8 a.m. to 4 p.m.